January, 1959, Torchy Lee and I moved into a trailer park in the Echo Park area of L.A. I went back to work driving for Yellow Cab. We had acquired some more show equipment, and we traded in our Cadillac on a little Willys station wagon. I quit Yellow Cab in April, and that was the last I ever worked for anyone else, even up till today! We contacted Mr. Chapman, owner of the Foley and Burke Railroad Carnival in Santa Rosa, CA. He had a big old heavy steel banner line, tent, stages, and show wagon (the show wagon is one of many wagons that carry equipment on flat cars on the train: when the destination is reached, the wagons are pulled off the flat cars and towed to the show grounds by tractor, where they are placed on location). We had inside equiment and banners, as well as p.a. sound equipment. He booked us for 40% of the ticket sales to the office. The Carnival opened the season in Santa Rosa in May. Foley and Burke was a fifteen car railroad show, the only one in the west. It played the same locations every year, due to being limited to going where the railroad lines went. 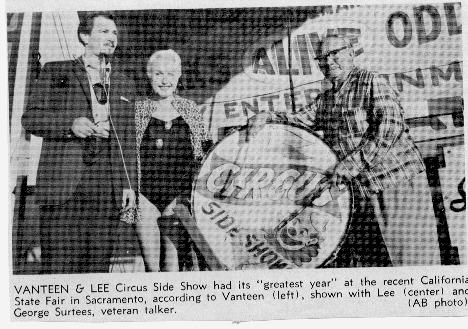 Some of the fairs we played were: Petaluma; Fresno; Bakersfield; Madera; Merced; San Jose; Yuba City; Chico; Modesto; Pleaseanton; Stocton; Sacramento (State Fair); and we always closed at the Ventura County Fair. (This is not the order we played them in, 'tho.) 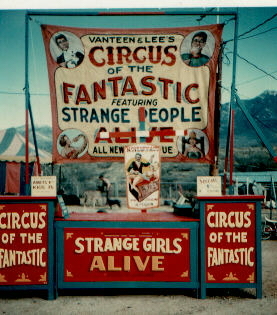 Our show consisted of the following: Super-X Illusion; Shrunken Head Illusion; Atomic Girl (we didnt have an electric chair but we had the gimmic, so Lee stood on a pizza pan, and did basically the same act as the electric chair: I'd light torches off her tongue or finger tips, she'd light neon tubes, etc. ); we had a Fire-Eater named Bill Unks, and a Blade Box. We also pitched the Blade Box- for a "donation" we would show people how it was done (always a big money-maker!). Lee handled and lectured on snakes- billed on the outside as "Sheila and her Reptiles". I did all the magic billed outside; the magic act was usually the "stall act"- that's stretching the act to hold the tip (the "tip" is carny slang for the audience or customers) while the talker is turning the tip on the outside, or holding the tip when business is slow. The only problem was I was both talker and magician! So sometimes I used a tape recorded outside when I was inside, and we usually had a ticket seller who could do a little talking (or "grinding" in carny). I worked the front, made most of the openings, and turned the tips. I used the Escape Cross with girl to build a tip. Inside, I'd do the magic act, and pitch. My magic act consisted of the Egg Bag; 20th Century Silks; my card fans and flourishes; and when stalling, I'd do the Miser's Dream and Abbott's Dissecto (and would you believe I still have the same one I used back then!). My card work was my specialty and the highlight of my act- even today I still do card fans, etc., when my arthritis allows, that is!........Working for Mr. Chapman was a fellow named Glen Beal (aka. Gary Hearn), who was the show painter. He was an excellent artist. He had formerly owned his own sideshow, and was an all-around showman and magician. We became very good friends, and on our evening shows he'd come in and do a little magic. He had a very good rope routine. He had an idea for framing a headless girl illusion that was very inexpensive and different from the standard way. So we built it and put it in the blow-off, and it made money! He used to really love to beat up a storm on our big bass drum to scare up a tip. Over the next twenty years he did most of our show painting: ticket boxes, fences, signs, and even some banners. In later years he worked for us full-time. He passed away in the early 80's........We stayed with Foley and Burke the whole season, closing in Ventura. In just this season, Lee and I had made more money than we'd ever made before, and enjoyed every minute of it because we were working for ourselves. We were able because of it to buy bigger and better equipment, too. During the season, we'd sold our Willys to Gary Hearn, and bought a used 3/4 ton International pickup. I put a rack on it, fitted the sides of the truck to carry break-down platforms, equipment went inside the bed, and later our poles and bannerline went on the top of the rack. We had an electric generator for emergencies on the right running board, and on the left a box that carried the steel tent stakes. The Blade Box folded down and was carried in a case on the outside of the truck. A very compact load! We pulled our 16ft. house trailer behind.......After closing the season, we returned to L.A., where last winter we had become acquainted with George Surtees, a veteran showman and talker; and his wife, who were the guardians of Schlitzie the Pinhead (more on Schlitzie later, they worked with us the following three years...). George had built us a 80-ft wooden banner line which was a lot easier to handle than the very heavy steel one we'd been using all season! We also bought a 20x60 tent from a tent and awning company in L.A........Off we soon went to Coolidge AZ. to join Capell Bros. Carnival at their winter quarters there. We had with us Bill Unks the fire eater, and Leilani, who was an impersonator and sword-swallower. We played around the cotton camps of southern Arizona in November and December. In November, Lee and I made it official by getting married, in Coolidge......January, 1960, found us back in the L.A. area. We spent the rest of the winter in a trailer park in El Monte, just resting and visiting other show people. Every week we'd go downtown L.A. to the PCSA (Pacific Coast Showmens Association) on Hope St. to "cut up jackpots" (in plain english that's just shooting the breeze and exaggeratng a bit!). Above: myself, Lee, and George Surtees. 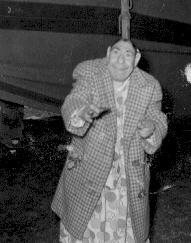 Below, the famous Schlitzie.